It has to be! Guess what? 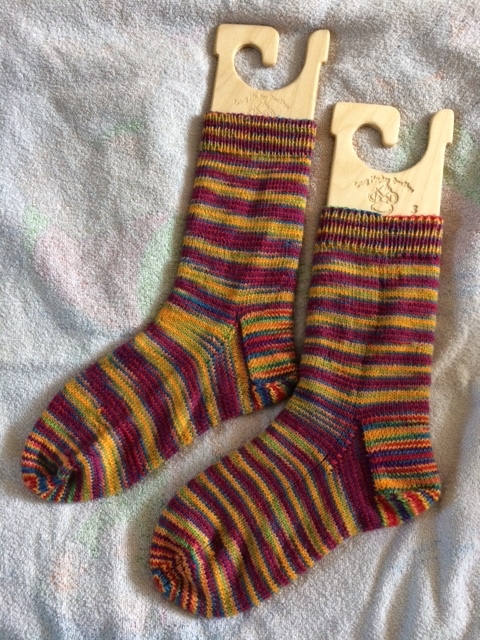 Today I finished 3 yes 3 pairs of socks! I’m so happy!!!!! I feel so very efficient and it is also a relief to get those off my needles and deminish my pile of WIPs! 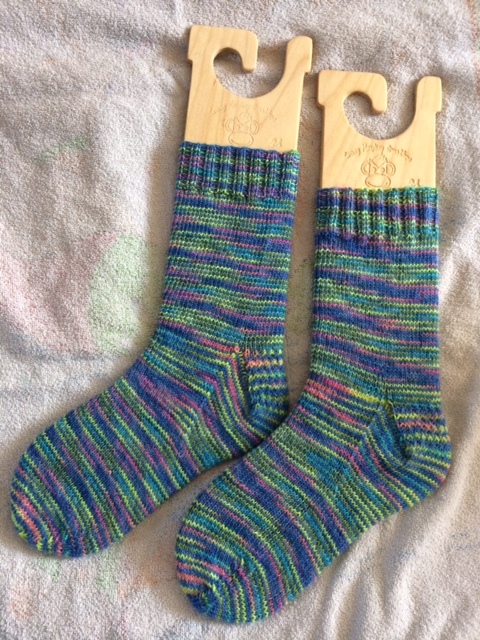 These are knit two at a time using the Kate Atherley method where one sock is inside the other. The yarn is Lorna’s Laces Shepherd Sock in Rainbow. I really love how the yarn tuned out. This is a pattern I just made up as I went. These were supposed to be my travel socks but I was so excited about the yarn that I cast on before travelling and ended up knitting on them so they stayed home. I showed you two skeins of yarns I think, that I dyed as a test and I sold one and kept the other and I think I’m going to try to repeat this colorway and create more like this because I really love how the yarn knits up. This is the pair I’m happiest about finishing because these have been on my needles for way too long. I had actually finished one sock and the other I was one pattern repeat + toe away from finishing. So today I finally did it! And I’m so happy! The yarn is hand dyed by myself and this is a 100% BFL I think and I love how the colors are together and I’m just so happy I managed to finish a pair with this much stranded colorwork. 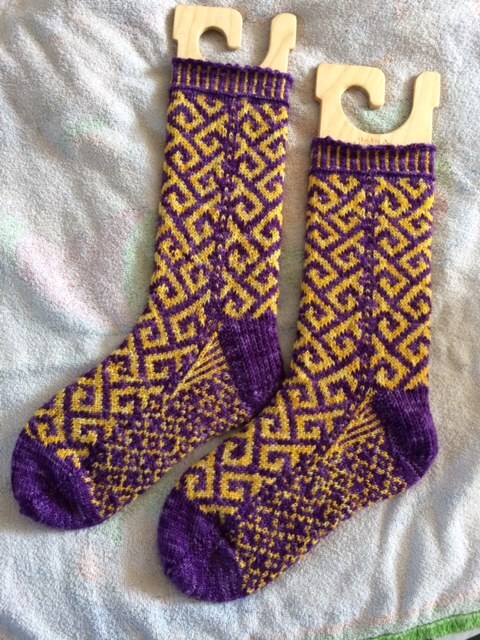 The pattern is called The Philosopher’s walk socks and is free on Ravelry. Wow that feels so good! To actually finish 3 items and see the pile of WIPs diminish! I need to continue on my path to finishing WIPs so I can cast on some more!!! Like I said before, I still have 3 pairs on the go and the one I’m most excited about finishing is the Strawberries and Cream socks by CC Almon. She designed the pattern using my yarn and I dyed up a special color way for this pattern that I call Strawberry Frappuccino. CC’s pattern is available for purchase on Ravelry and you can find it in her patterns shop – she is CC Almon or JavaPurl. 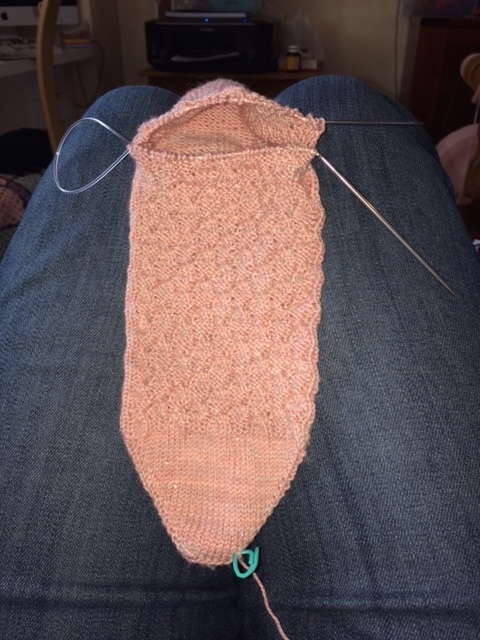 So I’m done with the heel and beginning on the leg. If you are interested in knitting these and maybe even use my yarn to do so, I would encourage you to participate in my giveaway if you haven’t done so yet. You can find all the info about that here but hurry as I will draw 2 random winners tomorrow October 14th. That”s all for today. I hope you are doing fine and enjoying your new week. And I look forward to being back tomorrow to announce the winners of the Giveaway (and don’t forget that even if you do not win, you will still get a discount code to use in my shop).